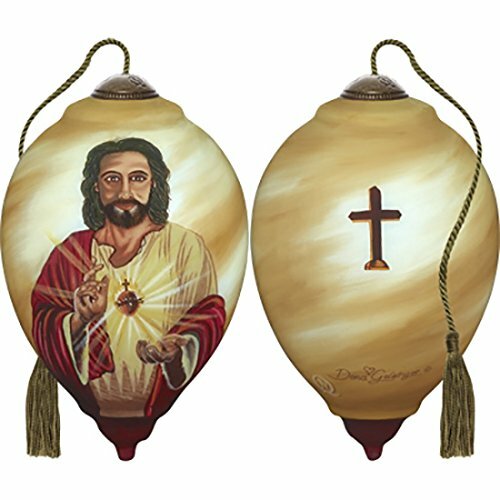 This Ne’Qwa art ornament features an image dear to many Christians around the world – the Sacred heart of Jesus. The roman Catholic devotion to the Sacred heart is a celebration of Jesus’ divine love for humanity. Keep this message forever close with this depiction of Jesus’ heart glowing with Holy light and love for the world. Meticulously crafted by artist Dona Gel singer and Ne’Qwa art with the centuries-old technique of hand-painting in reverse on the inside of hand-blown glass. Includes a signed certificate of authenticity. Beautifully packaged in a satin-lined keepsake gift box, it makes an inspirational Christmas gift for those who practice the devotion to the Sacred heart of Jesus. An adjustable tassel cord allows for display on a Christmas tree or a stand. Fits walnut finish large stand 7000006, classic stand 7000007 and Trio stand 7000020. This beautiful Ne’Qwa art ornament is approximately 5.5 inches high. Standard princess shape.